Be it fate or happenstance, while perusing a flea market, Cohrs came across a 99¢-copy of an old book, The Thousand-Mile Summer, written by acclaimed author, environmentalist, and backpacking icon, the late Colin Fletcher. The book documents Fletcher’s adventure to walk the length of California from Mexico to the Oregon border, a journey undertaken in 1958. Cohrs was so inspired while reading about this contemplative hike through the deserts and the High Sierra that he decided to celebrate a 50thanniversary voyage, retrace Fletcher’s footsteps and find out if he was right in stating that “this trip could never be repeated”. While researching and planning the journey, serendipity struck again. Through a chain of the most incredulous events, Cohrs was granted access to Fletcher’s belongings and was therefore able to retrace the exact route based on the original maps, notes, and hundreds of photos. So once again, a walker set out to take a look at America while comparing Fletcher’s observations from 50 years ago with today’s. Cohrs has written about and photographed California’s wilderness, its remotest places, the freaks of nature, and the various experiences and characters encountered along the way. The book is laced with interesting facts about flora and fauna as well as information about the earliest explorers and the history of the places that both Fletcher and Cohrs came to experience while passing through these less visited regions of the state. Among the highlights were those experiences that occurred during times when his solitude while walking in the vast wilderness overlapped with brief sojourns in the small towns along the way. It was there that he discovered the hospitality of the people, unfailing good and kind and generous. Time and again when he walked into a small town, he was a king for a day. Perhaps the most unexpected encounter, though, and a great inspiration were the lessons one learns about oneself on an extended journey like this. 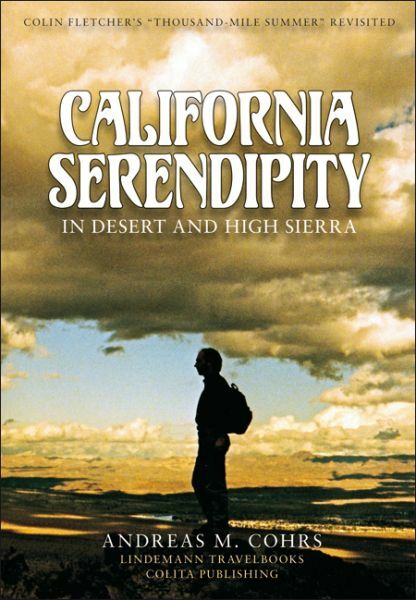 Weiterführende Links zu "California Serendipity"